Off to the slopes. But wait, what's this? Those beloved skis need a little TLC, the snowboard needs to be waxed and everything needs to be cleaned. No problem! 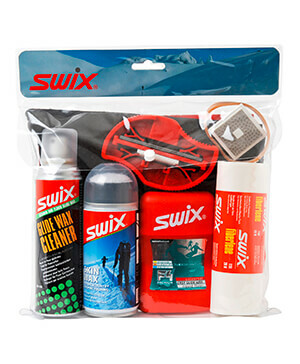 The famous brands like Toko, Swix and other brand manufacturers offer matching ski tools for ski care and ski repair. With the appropriate ski care tools, skis and boards can be quickly made as good as new and you'll be ready to whizz down the slopes! Which ski tools for which purpose? If you have winter sports in your heart, then you've probably also got a box filled with ski tools. What do you need in a well-stocked ski-toolbox? For ski care, the usual suspects are recommended like a waxing iron for the ski wax, wax remover, a ski brush and a repair candle. These skis tools ensure that the skis can be prepared for use before the tour. Various ski tools such as a jig or a ski carry help with work on the skis. But there are also ski tools that have to be on you need to take on your. A snow thermometer, for example. This ski tool is a compact little helper which can measure the snow surface temperature in seconds. This helps ski perfectionists in choosing a suitable wax. Crampons are ski tools, which are used in the binding of the skis and ease progress in frozen snow. There are practical transport cases for the storage and transport of ski tools. So you don't have to have a long search around the basement for all your ski tools before you head off. Whether waxing or cleaning, on tour or at home, good ski tools guarantee infinite ski fun without hidden surprises!